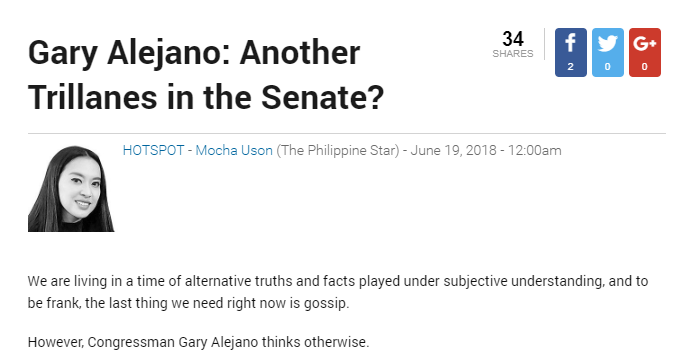 Home / Opinion / Trending Now / Mocha Uson on Gary Alejano: "Another Trillanes in the Senate?" 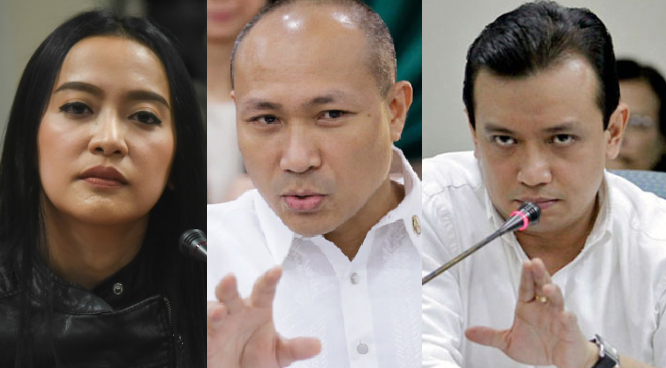 Mocha Uson on Gary Alejano: "Another Trillanes in the Senate?" 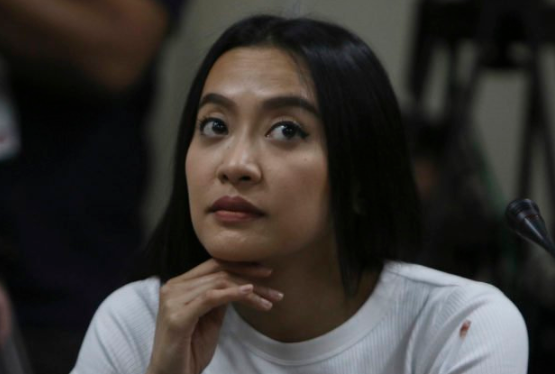 Esther Margaux "Mocha" Justiniano Uson, or simply known as Mocha Uson, a staunch supporter of President Duterte and currently the Presidential Communications Operations Office (PCOO) Assistant Secretary, shared her thoughts and opinion regarding Magdalo representative Gary Alejano. In her column entitled Hotspot on one of the top news media outfits in the country, Asec. Mocha then shared her disappointments and letdowns to Congressman Alejano for stating suspicious and controversial statements against the President. Asec. Mocha then conveyed that those malicious statements of the Magdalo representative is indeed a clear sign that Alejano is just playing blabbermouth to disturb the certainty and trust of the Filipinos for President Duterte. She also said that she actually finds it alarming that as early as this time, Alejano is showing off his approach to be seen, and it is all because he intends to run for Senate the following year. 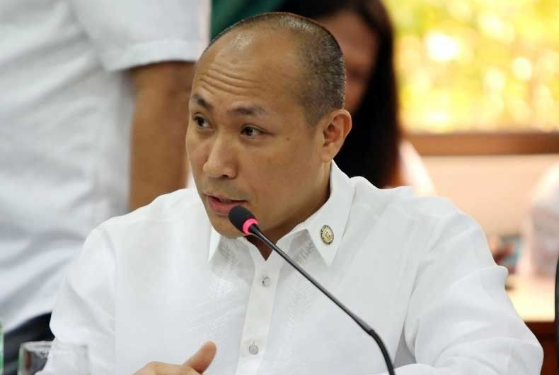 "His statements, taken out of context as he claims or not, are already a clear indication that Alejano is doing nothing but playing a chatterbox to disrupt the confidence Filipinos have for the President. I find it disturbing that as early as now, he is grandstanding his way to be noticed, and it is all because he plans to run for Senate next year. ", Asec. Mocha said. Likewise, the PCOO Asec. said that it actually worries her a lot that Alejano has not exclusively been spreading information that cannot be verified, however at the same time, sensationalizing the lies. She added that Alejano's retraction of statements about going to war with China likewise affects additional harm, as it mirrors a frail identity, as well as rather a weak image of the party he is speaking to in Congress. "It worries me a lot because Alejano has not only been spreading information that cannot be verified (all because he refuses to identify his sources), but are at the same time spreading them in sensational fashion. His retraction of statements about going to war with China also incites further damage, as it not only reflects a weak personality, but rather a weak image of the party he is representing in Congress. ", she added. Ms. Uson then ended her post by saying that the country already have someone doing all intents and similar things in the Senate and that they actually do not need another one. Not another Trillanes and undoubtedly not a poor impersonation like Gary Alejano. 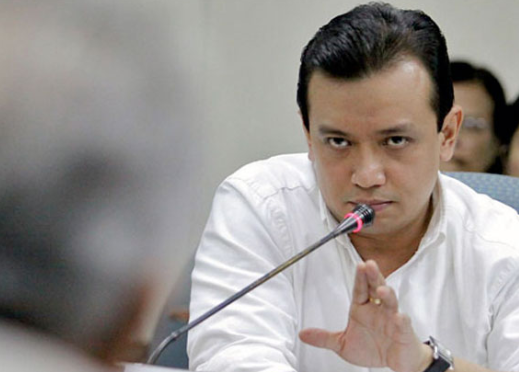 "Gary Alejano: Another Trillanes in the Senate?" "We are living in a time of alternative truths and facts played under subjective understanding, and to be frank, the last thing we need right now is gossip. However, Congressman Gary Alejano thinks otherwise. Over the weekend, the Magdalo representative stated in interviews that the Duterte administration has already ordered the AFP to stop patrolling the West Philippine Sea. Along with this dubious yet at the same time controversial statement, he asked rhetorically if that can be considered an impeachable offense, in the effort to smear the President’s name before the public. 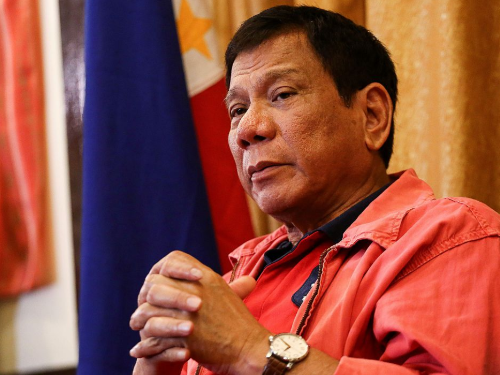 His claims, however, were immediately shot down by the AFP, with spokesperson Col. Edgard Arevalo saying that this is a “malicious imputation” on the President. 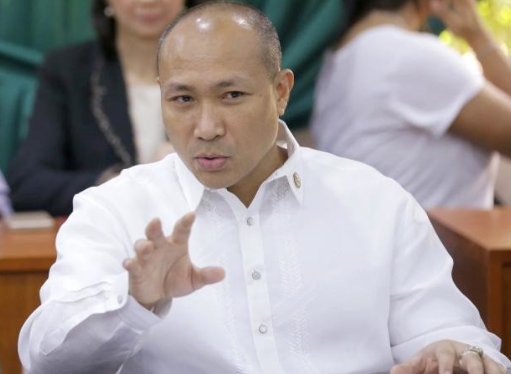 But rather than take a step back and rethink his statements, Alejano further fanned the flames by saying that the “Philippines can go to war with China,” which he later called out to be a statement taken out of context. His statements, taken out of context as he claims or not, are already a clear indication that Alejano is doing nothing but playing a chatterbox to disrupt the confidence Filipinos have for the President. I find it disturbing that as early as now, he is grandstanding his way to be noticed, and it is all because he plans to run for Senate next year. I do understand the side of those who do not agree with the “soft” stance of President Durterte’s administration regarding patrolling the West Philippine Sea, and Alejano is one of them. But Alejano might have forgotten about this term called “diplomacy,” which is being exercised at the moment. It saddens me as well, for Gary Alejano was someone we looked up to. While a well-known critic of the President, he used to have sound criticisms that the Administration took into careful consideration, because despite being on the opposite sides of history, Alejano also shared the same fervor of leading the country to a better future. It was only when he started getting support to run for Senate did he begin showing his true shade, which was probably yellow. Another thing that bothers me is when Alejano stressed the need for strong institutions to improve peace in the country, as according to a recent study of Global Peace Index 2018, the Philippines ranks the second least peaceful country in the Asia-Pacific, next to North Korea. Strong institutions call for unity and cooperation of the state and civil society, including the church, academe and the media. But how can we exactly do this when these very institutions turn against each other with rumors and lies? And how can we do this when the people we have elected into office are also the same ones spreading rumors and lies? It worries me a lot because Alejano has not only been spreading information that cannot be verified (all because he refuses to identify his sources), but are at the same time spreading them in sensational fashion. His retraction of statements about going to war with China also incites further damage, as it not only reflects a weak personality, but rather a weak image of the party he is representing in Congress. Yet despite these, Alejano intends to run for Senate. But we already have someone doing practically the same things in the Senate. And honestly, we do not need another one. Not another Trillanes. And certainly not a poor imitation like Gary Alejano."